A prisoner of war (short form: POW) is a fighter who has been captured by the forces of the enemy, during an armed conflict. In past centuries, prisoners had no rights. They were usually killed or forced to be slaves. 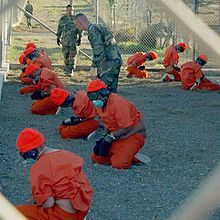 Nowadays prisoners of war have rights that are stated in the Geneva Conventions and other laws of war. If they are very sick or hurt, prisoners of war have the right to be let go. After a war ends, all POWs must be let go quickly. According to the Geneva Conventions, if soldiers do not meet these requirements, they are not "prisoners of war." They are "unlawful combatants" (which means "people who fight in ways that are against the law). This means they do NOT have the rights that are listed in the Geneva Conventions. The U.S. brought some of these people to a prison in Guantánamo Bay. Because they were enemy combatants, the inmates at Guantánamo did not get the rights that the Geneva Conventions give to prisoners of war. When a country, or a group of people, does not give prisoners of war their rights, they are committing a war crime. However, punishing those war crimes has not always been easy. The Geneva Convention lists the rights that prisoners of war have. However, there is nothing in the Geneva Convention that says how people should be punished when they do not give prisoners of war these rights. In the past, when a country broke the Geneva Convention by not giving prisoners of war their rights, many different things might happen. For example, after World War II ended, the countries that won the war set up military tribunals called the Nuremberg Trials and the Tokyo Trials. At these trials, military leaders from Nazi Germany and the Empire of Japan were tried for crimes against prisoners of war (and many other things). Many of them were convicted and sentenced to death or to life in prison. However, at other times, crimes against prisoners of war might be tried in the same country where the crimes happened. This might happen before or after the war ended. Sometimes crimes against prisoners of war were not punished at all. In 2002, the International Criminal Court (ICC) was created to look into war crimes around the world, and punish people for them, if possible. If a country, or a group of people, commit a war crime against prisoners of war, the ICC can put them on trial and punish them if they are found guilty. In 1944, 76 Allied POWs escaped from a Nazi POW camp through a tunnel. The Nazis re-captured 73 of them and executed 50. ↑ 2.0 2.1 2.2 2.3 2.4 2.5 2.6 Diplomatic Conference for the Establishment of International Conventions for the Protections of Victims of War (August 12, 1949). "Geneva Convention relative to the Treatment of Prisoners of War" (PDF). Retrieved March 5, 2016. ↑ 3.0 3.1 "Geneva Convention". Peace Pledge Union. Retrieved March 4, 2016. ↑ 4.0 4.1 Borelli, Silvia (2004). Enforcing International Law Norms Against Terrorism (Studies in National Law, Volume IV). Hart Publishing. p. 42. ISBN 978-1841134307. ↑ Chlopak E 2002. "Dealing with the Detainees at Guantánamo Bay: Humanitarian and Human Rights Obligations under the Geneva Conventions". Human Rights Brief (American University Washington College of Law) 9 (3): 6-9, 13. http://digitalcommons.wcl.american.edu/cgi/viewcontent.cgi?article=1456&context=hrbrief. Retrieved March 5, 2016. ↑ Penrose, Mary Margaret. "War Crime". Encyclopaedia Britannica. Retrieved March 4, 2016. ↑ "About the Court". International Criminal Court. Retrieved March 4, 2016. ↑ International Criminal Court (2011). Elements of Crimes (PDF). The Hague, Netherlands: PrintPartners Ipskamp. pp. 1–44. ISBN 92-9227-232-2. ↑ Łojek, Bożena (2000). Muzeum Katyńskie w Warszawie. Agencja Wydawm. CB Andrzej Zasieczny. p. 174. ISBN 978-83-86245-85-7. Retrieved 7 May 2011. ↑ Roberts, Geoffrey (2006). Stalin's Wars: from World War to Cold War, 1939–1953. Yale University Press. p. 171. ISBN 978-0-300-11204-7. Retrieved 16 June 2011. ↑ Olson, John E. (1985). O'Donell: Andersonville of the Pacific. John E. Olson. ISBN 978-9996986208. ↑ Office of the Provost Marshal General (November 19, 1945). "Report on American Prisoners of War Interned by the Japanese in the Philippines". Office of the Provost Marshal General. ↑ "Great Escape". Nova (PBS). 2004-11-16. No. 582, season 31. ↑ Andrews, Allen (1976). Exemplary Justice. Corgi Books. pp. 56–57. ISBN 0-552-10800-6. ↑ Appleman, Roy E. (1998). South to the Naktong, North to the Yalu: United States Army in the Korean War. Department of the Army. p. 349. ISBN 978-0-16-001918-0. This page was last changed on 14 March 2019, at 07:47.